In recognition of their team’s achievements in revolutionizing how scientists see protons' roles in turning electricity into hydrogen fuel, Daniel DuBois and Morris Bullock were interviewed by Chris Jones, ACS Catalysis Editor-in-Chief. Sputnik being launched into space. That moment inspired Dr. Daniel DuBois to enter the world of science. For Dr. Morris Bullock, it was finding an environment where he was challenged and could work on important scientific problems. Together, they led the hydrogen catalysis team at Pacific Northwest National Laboratory in revolutionizing how scientists see protons' roles in turning electricity into hydrogen fuel. 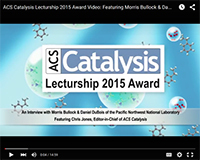 The American Chemical Society recognized the team's discoveries with the 2015 ACS Catalysis Lectureship for the Advancement of Catalytic Science. 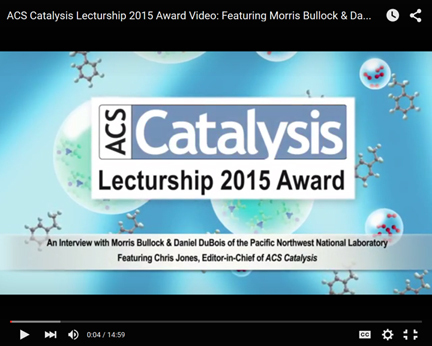 In recognition of their team's accomplishments, DuBois and Bullock were interviewed by Dr. Chris Jones, ACS Catalysis Editor-in-Chief. In the video interview, they share what it took to elucidate the design rules of one of the great breakthroughs in catalysis of this decade - the diphosphine-amine ligands that facilitate the creation of hydrogen fuel. They also share the value of having the right team. "It's important not just to have a team that has the expertise but to have people that genuinely want to work together," said Bullock. He also spoke of the value of the funding from the U.S. Department of Energy to allow their team to tackle difficult problems that would not be solved quickly. The other team members are Monte Helm, Michel Dupuis, Simone Raugei, Jenny Yang, John Roberts, Molly O'Hagan, Wendy Shaw, Aaron Appel, and Eric Wiedner at PNNL, and Sharon Hammes-Schiffer at University of Illinois. Yang is now at the University of California, Riverside; Roberts is now at REC Silicon. The team is part of the Center for Molecular Electrocatalysis, an Energy Frontier Research Center. The DOE Office of Science's Basic Energy Sciences funds the center. The award will be presented at the 2015 ACS Fall National Meeting & Exposition in Boston, August 16-20. At the meeting, a symposium will be held in the team's honor. The research that led to this award was funded by the Center for Molecular Electrocatalysis, an Energy Frontier Research Center funded by the U.S. Department of Energy Office of Science's Office of Basic Energy Sciences.